Fall is here and thats means apples. Many of the apples grown west of the Cascades have scab or are infected with coddling moth. The result is that apples that aren’t very appetizing to eat out of hand, but still can be used to make great applesauce. You can also buy apples by the box at your local farmers’ market and these can be used straight or mixed with your homegrown apples. I like to talk with the grower and see what breeds they like to make into sauce. One of my favorite growers is Tonnemaker Family Orchard. They have great produce, good prices and often have seconds boxes that are lower priced and great for canning. 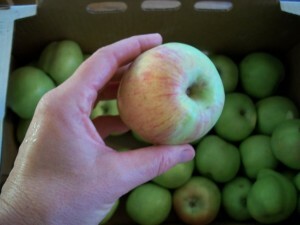 Last week they suggested Gravenstein apples so I bought a box to mix with my own apples. Pick out apples that are free of mold and rot. They don’t need to be pretty but they should be wholesome. Core your apples then cut them up into about one-inch chunks and cook them over a low heat until soft. 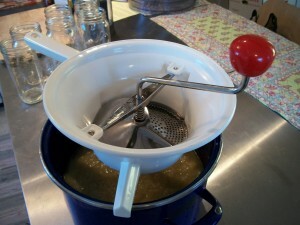 Then put the mixture through a food mill to separate the skins from the fruit and turn it into a sauce. Here is a food mill I got at Fred Meyer. They can also be found sometimes at Goodwill. If the sauce is too tart then add in a bit of brown or white sugar. I like to put in some cinnamon as well. Heat the sauce, while stirring constantly, to boiling and boil for one minute and pour into sterile jars. Be careful because blobs of the hot sauce can leap out of the pot and give you a burn. 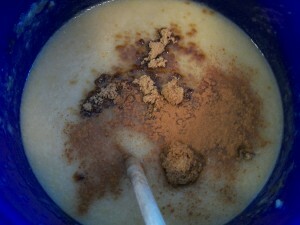 Here it is heating up with cinnamon added at the end of cooking. Once it begins to bubble it will be ready for the jars. Process the jars in a boiling water bath for 15 minutes and you’re good to go. 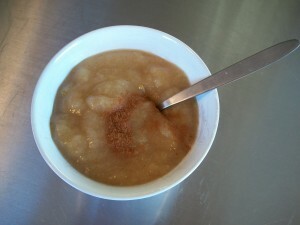 Applesauce can be eaten as is or can be used in many recipes. I like lots of cinnamon so often add even more before I eat my sauce. My family varies on their degree of cinnamon adoration so I go light when canning it. I have to agree about Tonnemakers Orchards. I have purchased there apples for years at Farmer Markets. Thanks for the great post!